Firstly, I must sincerely appreciate all those who not only have passion for music, but go the length in investing their resources to write, perform, record and promote their musical works. Without music, there is no radio. The fact that you are reading this post right now makes me assume you probably have interest in getting your songs played on Praiseworld Radio and other radio stations OR you maybe just want to get some more information about how radio plugging works. Over my years of experience as an upcoming artiste back in the day, a radio DJ and on air personality in several radio stations, blogger, music promoter and now CEO of Praiseworld Radio, I have carefully observed some very simple (but recurrently overlooked) factors that make some songs get massive airplay, while some never find their way to the music library of the radio station in question. 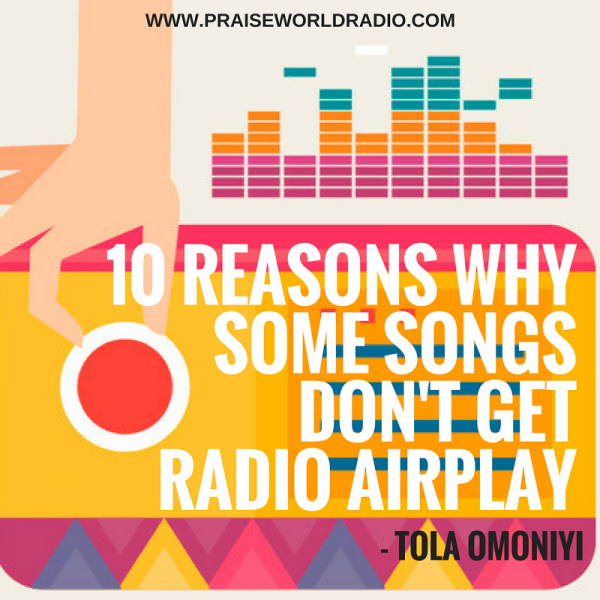 Now let’s discuss some basic fundamentals, some of the reasons why some songs do not get airplay on radio. My sentiments are on gospel music, but it applies to other genres of music as well. 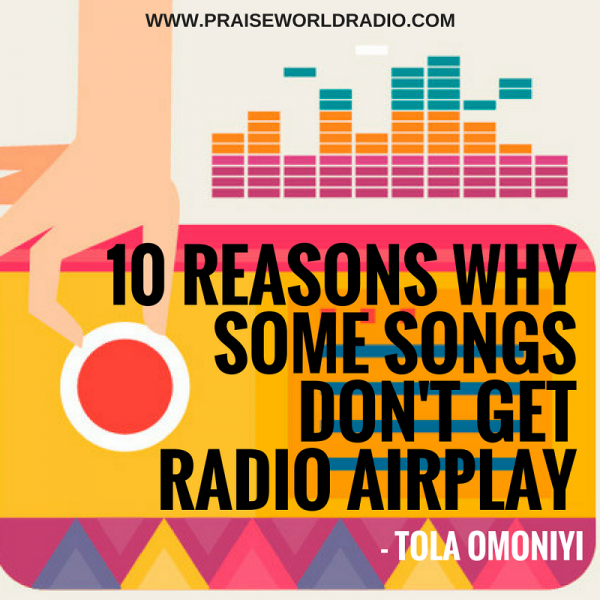 I’ll also share tricks that will help you avoid these minor but sensitive mistakes that sometimes mar your chances of getting the airplay you so desire. Gospel Music is not thrash music. It is not the leftover of good music. So if you are in the “Since-I-couldn’t-make-it-in-the-secular-world-due-to-stiff-competition,-let-me-give-gospel-music-a-try” category, no apologies – you have totally missed it! The truth is “Real music” started from the Church, so gospel music should be classified as the headquarters of good music. Make sure the music you are putting out is of very good quality. DJs/OAPs love good music. As a matter of fact, it’s hard for them to resist it. Whatever the genre you choose, be the best at it. Make it top notch! Some songs may be good but not specifically air worthy. Don’t get confused. It’s quite easy to understand. As an artiste, you must have a target audience. What are you singing about? What category of people is your music directed at? What class of people do you think will be able to comfortably relate with your song(s)? The answer to these questions will not only guide you when writing/arranging your songs, but will also help you determine what station to send your music to when produced, and by extension what DJ/OAP to approach first. Every radio station has a personality, which is reflective of her target audience, and influences the kind of songs they play. 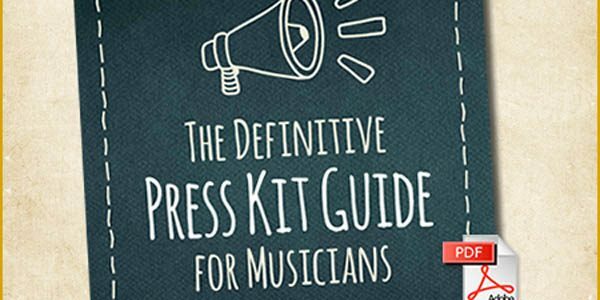 Determine your music’s target audience, and her kind of radio station(s). It is imperative you start from here. Once you succeed at this starting point, expanding to other stations and DJ/OAPs would be less a challenge. Lots of amazing songs die before even getting out of the studio. The importance of quality production can never be overemphasized. You can play your part as an artiste excellently for all I care; as long as the production is wack, the song is wack. Good production may cost you some bucks, but trust me, it is worth it if you mean real business. Sometimes when artistes send in their songs for airplay, I listen for about 30seconds and make a conclusion – Now that is where production speaks loudly. When it is properly mixed and mastered, it catches the ear of “radio”. Like I said earlier, DJs/OAPs love good music. If it is really good, it will be pretty hard to resist. P.S: Do NOT attempt sending your song to a radio station via WhatsApp or other social media networks. There is likelihood that the quality may be compromised, while it tries to scale the file to a lower size. What radio station is willing to play a 10minute song on air? Nah! That’s too long. Yes, the song sounds nice. Probably a live recording or a lovely tune such as Travis Greene’s Made A Way, but not for radio! Such songs are edited to fit radio purposes. Your song should NOT be more than 5minutes. That’s actually long. Keep it short. The shorter, the better. I recommend 3-4minutes. Also, be sure to tag your song properly. How do you expect a song with tags like “Unknown Artiste”, “Unknown Album” or “Track 2” to get airplay? Ok, let’s assume it gets played, and a listener asks “Please Praiseworld Radio, who sang that song you just played, what’s the name?” What do you suggest our response should be like? “Track 5 by Unknown Artiste”? lol. You must have heard the saying “Don’t judge a book by its cover” or “It’s not about container, but the content” right? While that might be true, what happens when people are not patient enough to see the content due to the very poor container carrying it? See your album cover art that way. It adds panache to your work. A very well designed album art breeds prestige and class. Even when the content does not have the corresponding top notch quality, it at least seduces the OAP/DJ to give it a listen (no pun intended), which is one good step in the right direction. What really is the point in sending a radio station one of your “fair” songs for airplay when you have a much better one? Like really, what are you keeping the “good” one for? Some say they are keeping it for the full album, and I wonder “who would care to give you a ‘second listen’ chance, when the first was a disappointment?” Let’s put it this way – your first listen impression really matters. Don’t push more than ONE SONG AT A TIME for promo. Pushing more than one song at a time distracts media focus and makes the promo effect watery. Make a strong debut. Push it. Brand it. Let the OAP/DJ know you for that one song. When you succeed with this, your next single will be anticipated by both the OAP/DJ and your new fans. First, let me remind you that no matter how insignificant you think a particular radio station might be, there are probably tons of artistes sending their music works to her. This gives you an idea how many mails could be in that email box destination you are sending yours to. That said, I strongly advice – Do not send blank mails with attachments only, or poorly written press releases. They do not command attention and they are very easy to ignore. Endeavour to send a well written note containing basic information along with your mail. How will it feel airing a song with a foreign website address tag on it? If you ask me, I’ll say “Not professional”. Be aware that some songs are not only given airplay, but also featured on the music page of the radio station’s website (www.praiseworldradio.com/audio in this case). Do not attempt sending your song as a link from some other site. Can I be honest with you? No serious website is interested in publishing any multimedia content with a foreign website tag on it. They will rather you send directly to them so as to brand it to their taste. Sending links of your song, bio, profile from other sources could only be sent as additional info, not the primary source. Send your song directly as a file. It’s more professional that way. Better still, get a professional media kit! SONGS NOT IN MP3 FORMAT. Like Seriously? Send your songs in MP3 format. If you worked with a professional producer, you won’t even need to read this paragraph. MP3 is a generally compatible format for most players. Sending your song in wma, wav, vlr or any other strange format would do you no good. Not every OAP/DJ will have that patience or time to do the conversion for you. It is advisable you play your part so well to an extent that all s/he will need do is download, listen….and “air-Play”. Now this is for those who don’t have ACTIVE social media accounts already. *pauses* But seriously, why don’t you have a twitter/Instagram/Facebook account? You are an entertainer. You are a celebrity to be. You are someone’s mentor. You are a protégé to someone who is also very likely on social media. The radio station you want airplay from is on social media. The DJ or OAP you are trying to get across to is on social media. Again I ask, WHY ARE YOU NOT ON SOCIAL MEDIA?! Make sure you get a twitter account immediately you’re done reading this letter, by simply CLICKING HERE. Follow the right people, get active and interactive. Don’t just have a social media account. Be active. Don’t be a ghost! Follow the radio station, DJ and OAP, get involved in their shows, become much intimated with the radio station till you become ‘family’. This is what we mean by being “social”. Some multi million dollar deals are sealed over a drink, a game or dinner, or…on social media. Be smart. Don’t choke or stalk the DJ/OAP. Choking him/her won’t get you airplay; instead it could and will likely cause a counter effect. VERY IMPORTANT: If and when your song gets played, show appreciation, show gratitude. Tweet at them, say “THANK YOU!” Always do! ALWAYS! It’s safe to assume you intend performing on some of those big music platforms in the near future, right? So why in the world are you not there watching others do what you’ll be doing soon? Asides from the fact that you get to learn a whole lot, you also stand a chance to expand your network. Attending music gigs and events gives room for you to meet several artistes, producers and other entertainers like yourself. Who knows, you could get to meet a top artiste who will someday feature on your track, whose leverage you can take advantage of. You could also meet some of these DJs/OAPs, start and develop a relationship with them. This goes a long way. Stick around to Praiseworld Radio not to ever miss any gospel event ever again. Finally, ALWAYS remember The GOD Factor. Paul can do all the planting, Apollo the watering, but it is only GOD that is capable of giving the increase (I Corinthians 3:6-7). May God cause the work of your hand to prosper in the name of His precious Son Jesus. 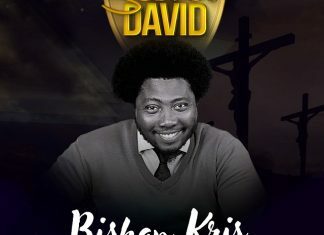 I sincerely wish you the best in your music career and ministry, so you can be a blessing to the world at large. Stay tuned to your favourite gospel radio station PRAISEWORLD RADIO for exclusive urban gospel music all day…every day! Cheers!! !